What does it mean to have Great Faith? At points throughout the Gospels, Jesus referred to people with “great faith.” One of them was a Phoenician woman. The incident recorded in Matthew 15:21-28 drips with controversy. At the outset, you certainly get the sense when Jesus spoke of her great (megas in the Greek) faith, He was speaking of a woman with huge quantities of faith. But it is no coincidence, this account is strategically situated only 18 verses after Peter’s walk on water where Jesus admonished His Apostle for his ‘little’ faith (Matthew 14:22-32). Matthew purposely contrasted the ‘little’ faith of Peter with the ‘great’ faith of a gentile woman — a humiliating exercise for any self-respecting Jewish man. And this is where it gets interesting, because you can only understand the Phoenician woman’s “great” faith in light of Peter’s “little” (in the Greek ‘oligos’) faith. In a previous article, I discussed the various meanings of “oligos.” It can refer to a small quantity (James 3:5) or brief as in time (Revelation 12:12). Since Peter actually walked on water, Jesus was not referring to the apostle’s “small” faith but rather his “brief” faith meaning he quit believing. However, reading the verse many believe Peter needed more faith, when actually he allowed doubt and fear to erode the walking-on-water faith he already had. So how did Jesus intend us to understand the woman’s ‘great’ faith? To understand how Jesus used this word we need to take a closer look at the story. In Matthew 15:21, Jesus entered the district of Tyre and Sidon. This was gentile territory, an area that Jesus to this point had avoided. A woman with a demon-possessed daughter approached Christ’s entourage pleading for help. The Bible tells us Jesus ignored her (Mathew 15:23). The ever-merciful disciples asked Christ to send her away complaining her shouts annoyed them. But this desperate woman would not take “NO” for an answer. She curtly ignored their rebuffs and continued to plead for help. It was this commotion that finally caught Jesus’ attention. “I was sent only to the lost sheep of the house Israel,” Jesus said, explaining to her as tactfully as possible why He could not deliver her daughter (v 24). But the woman finally had the undivided attention of the one man who could help and she stubbornly refused to stop. “Lord, help me!,” she pleaded again (v 25). Her unwavering persistence forced Jesus to use stronger language. He said, “It’s not good to take the children’s bread and throw it to the dogs” (v 26) — dogs being a term of contempt the Jewish community commonly used to describe gentiles. In other words, the Lord deliberately insulted this woman. He tried to offend her and drive her away. How unChrist like? Or was it? Even in the face of this heightened rejection, the woman said, “Yes Lord, but even the dogs feed on the crumbs, which fall from their master’s table” (v 27). This Phoenician woman doggedly stood her ground even after Christ rejected her twice. Desperation will bring you to the point where you just don’t care what people think. But it was her unrelenting persistence that caught Jesus’ attention. “O woman, your faith is great; it shall be done for you as you wish,” Jesus said. The woman’s daughter was immediately delivered. Jesus saw something in this woman, and He used it to teach His disciples yet another lesson on faith. This is why He deliberately tried to push her away. It was a blatant contrast to His words to Peter when Jesus said “Come” inviting His disciple to join Him on the water (Mathew 14:29). 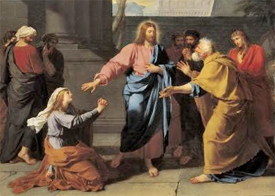 This unclean gentile woman was the perfect antidote to Peter’s brief faith and unbelief. She refused to quit believing. She did not allow unbelief, doubt or fear to erode her faith. There are a number of words that describe this woman’s faith: persistent, stubborn, obstinate, intransigent, unyielding, harassing, nagging, determined, resolute, unbending, relentless, inflexible, dogged. Previous PostThe lost coins of Jesus?